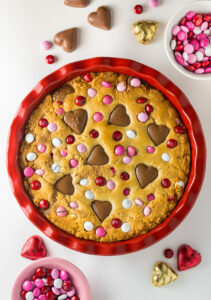 This deep dish Valentine’s Day Cookie Pie is loaded with festive M&M’s and Heart Shaped Peanut Butter Cups! 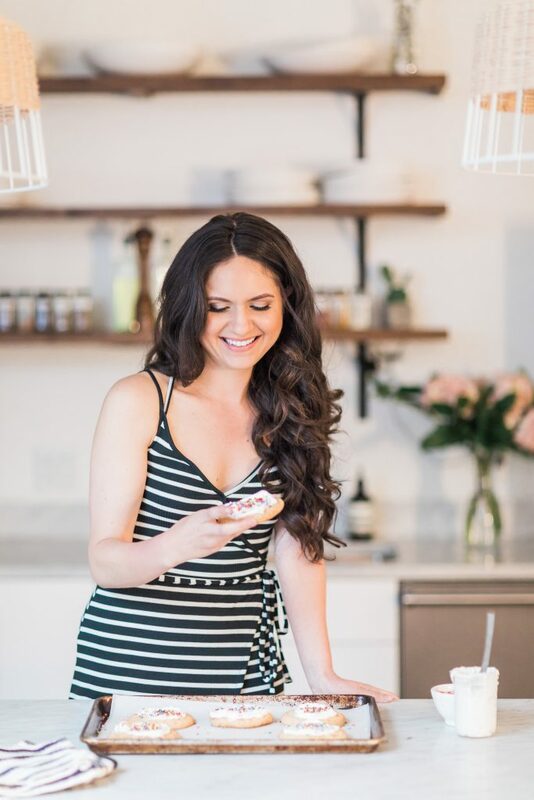 Since National Pie Day falls on a Monday – and Mondays are never easy – I wanted to share a recipe with you that’s simple enough to whip up on a weeknight. Enter this fun and festive Valentine’s Day Cookie Cake! Each bite is chewy, crunchy, chocolatey, and loaded with peanut butter cups. Each bite is BLISS. Throughout the months of January and February, you should be able to easily find Valentine’s day colored M&M’s and heart shaped Reese’s at most grocery stores and pharmacies. I bought both of these at CVS, and I know my local Walgreen has them too. That said, you can totally use regular M&M’s and mini Reese’s cups instead. 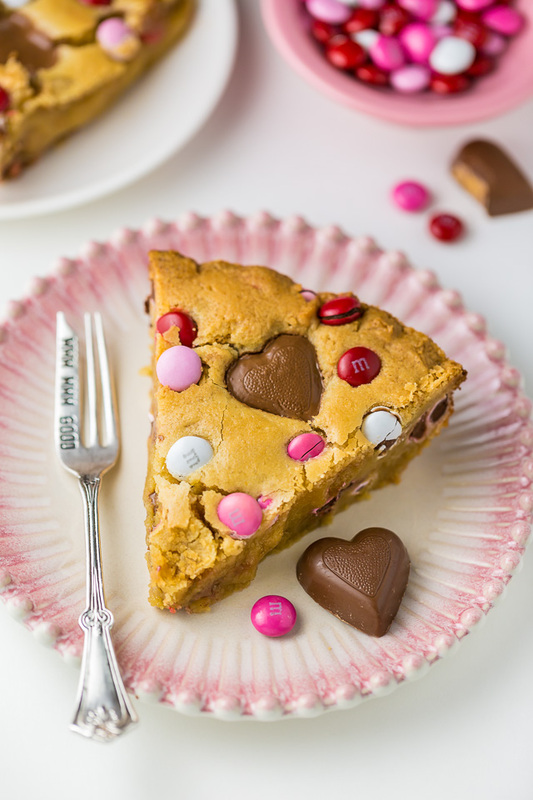 Don’t over bake your Valentine’s Day cookie pie! Although I’ve given an estimated bake time in the recipe box below, every oven is a little different, so be sure to pay attention to visual clues. When your pie has a shiny, golden top, set edges, and just a little jiggle in the middle, it’s ready to come out of the oven. Over baking will result in a dry, crumbly cookie pie. Allow the cookie pie to cool on a wire rack for at least an hour. 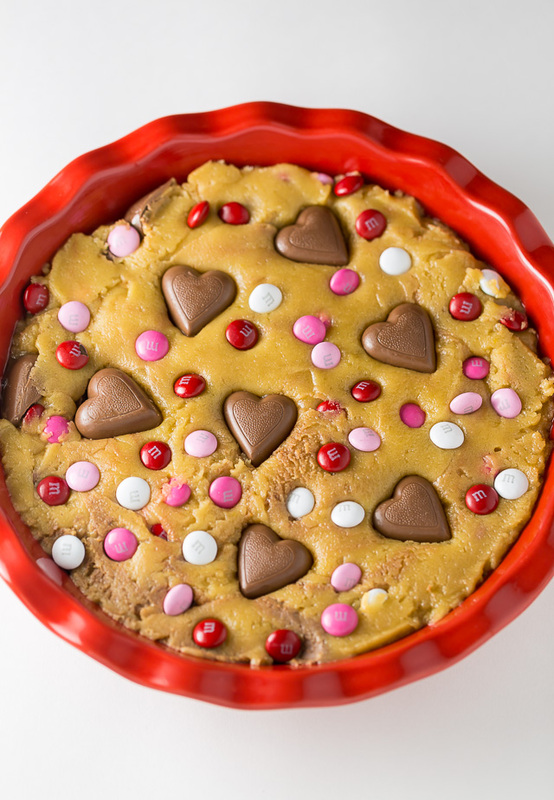 If you’d like your cookie pie to look exactly like the one you see in my photos, press extra M&M’s and peanut butter hearts on top right before baking. For an extra decadent dessert, serve this pie with a scoop of ice cream on top! 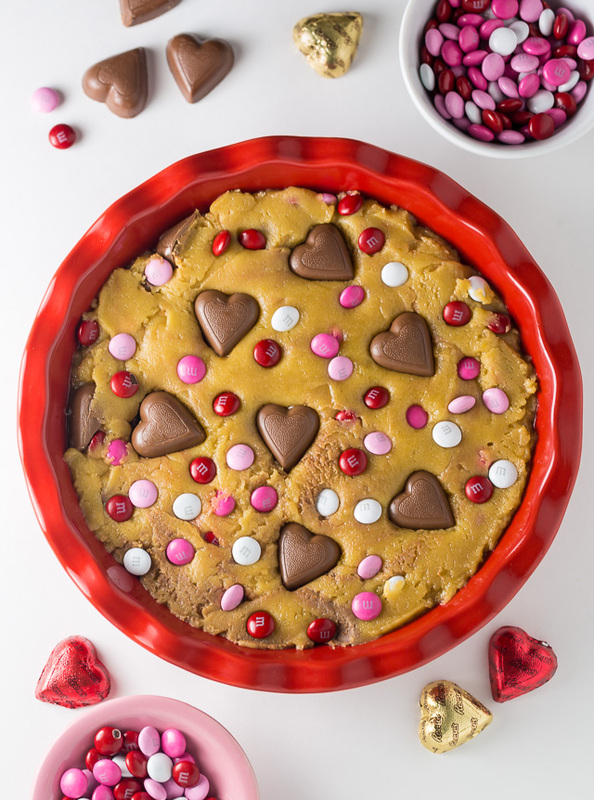 This deep dish Valentine's Day Cookie Pie is loaded with festive M&M's and Heart Shaped Peanut Butter Cups! Preheat oven to 350 degrees (F). Light spray a 9" pie plate with non-stick baking spray; set aside. In a large bowl add the melted butter, brown sugar, and granulated sugar; beat well until combined. Beat in the egg, egg yolks, and vanilla. Add in the flour, cornstarch, and salt and mix until just combined. Be sure not to over mix here! Fold in the M&M's and chopped peanut butter cups. Spread the mixture into the prepared pie plate. Top with additional M&M's and peanut butter hearts, if desired. Bake for 38 to 40 minutes, or until the top is golden brown, the edges are completely set, and the center of the pie is only slightly jiggly. If your cookie begins to look too dark, you can place a piece of tin foil over the top until it's done baking. Place pie on a wire rack to cool for at least one hour before slicing and serving. 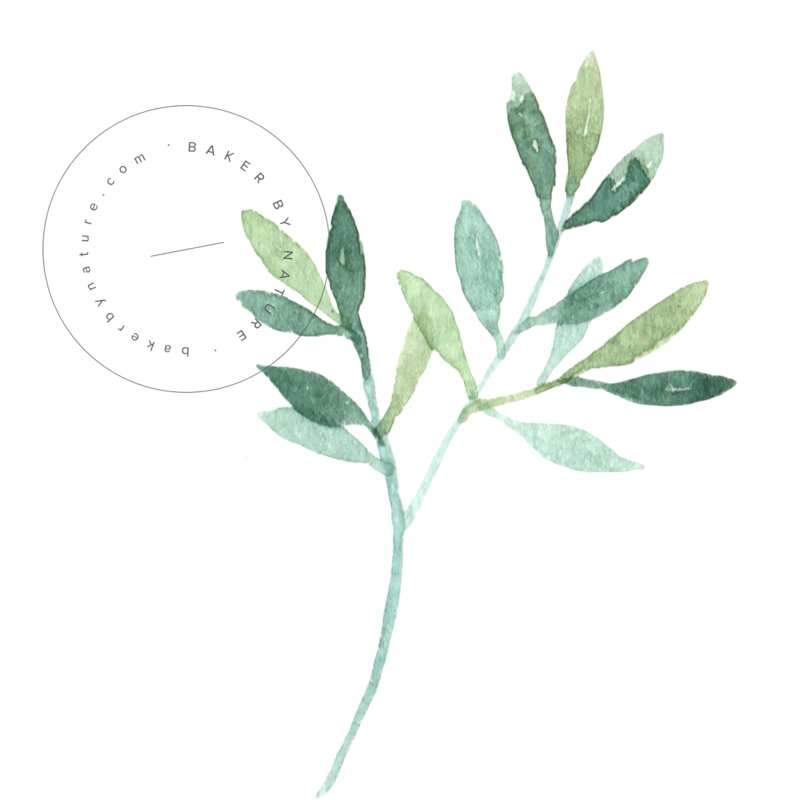 This is gorgeous, and I’m sure it’s delicious! I’m a sucker for all the Valentine’s Day candy and other treats . . . just so perky! and COOKIE PIES FOR ALWAYSSSS! It would be difficult to overstate how happy this makes me feel. Okay, this is too cute. And looks too darn delicious. Love how pretty and festive it is! can I add less sugar that seems like a lot ? I haven’t tested the recipe with less sugar so I cannot predict what the outcome will be like if you reduce it. Mine didn’t turn out near as pretty or as neat. Wishing I had put a cookie sheet on the rack below, because it overflowed my 9 inch pan. Baked longer than stated, and even though I took it out when the center was just barely jiggly and waited 2 hours before cutting into it, it was raw/runny in the middle. Would suggest only using 1 stick of butter and maybe more flour. Edges tasted good – very rich. Hi there. I’m very surprised to hear your cookie pie overflowed. This batter is extremely thick and doesn’t rise at all, so I’m not sure how that happened. I’m sorry to hear you had so many issues with this recipe – I know how frustrating that is! Let me know if there’s anything I can help clear up. Interesting – my batter wasn’t thick. Oh well. I want to make this for my husband and kids! Do any adjustments need to be made if you don’t use PB cups (my kids are allergic) or do you suggest any substitutes?